Old Bay Seasoning has been a favorite in the state of Maryland for decades. Ever since it’s development in late 30s, many have been using it to enhance things from crabs to hamburgers. While the seasoning used to only be enjoyed by Chesapeake Bay residents, its mass production and popularity have allowed it to spread across the country. However, it will always be most popular in Maryland, famous for its crabs, but especially Baltimore, where crabs are eaten most frequently. Back in 1939, a German immigrant named Gustav Brunn came to America, with the goal of starting a famous spice business. It was him who developed Old Bay seasoning with a primitive spice-grinder and a few basic ingredients. Because he was in Baltimore, and crabs were plentiful, people quickly took to his unique brand of seasoning, and Brunn got to live the American dream. He even named the seasoning after an old steamship line that served passengers and moved cargo on the Chesapeake Bay (Old Bay). It’s been over sixty years, and Brunn’s seasoning still enjoys moderate fame. Unbeknownst to many people, Brunn was one of the many Jews to escape from Germany after Kristallnacht. However, little else is known about the man who invented Old Bay. Back when Gustav Brunn created Old Bay Seasoning, crabs were so plentiful in the Chesapeake Bay that bars often offered crabs for free, and seasoned with salty seasonings in order to sell more beer to the patrons. Old Bay is just one of these bar seafood seasonings, and is the seasoning that has survived the test of time. Of course, Gustav Brunn does not make Old Bay Seasoning anymore. 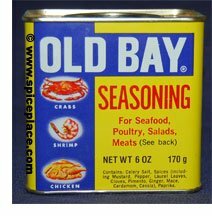 His company, The Old Bay Company was sold, and the company which purchased the rights to Old Bay is McCormick & Company [McCormick also a Baltimore, Maryland based spice company], which now manufacturers Old Bay and many variations of it. McCormick sells Old Bay across the nation through it’s distribution channels and has transformed a regional taste into a national product, almost certainly generating millions of dollars a year through their ventures. Besides the classic “Old Bay” seasoning which McCormick markets, the company also produces varieties such as “Old Bay with Lemon and Herb”, “Old Bay with Garlic and Herb”, “Old Bay Crab Cake Classic”, and many more. It’s for certain that McCormick will be here for a long time, perhaps making even new kinds of Old Bay, with new and possibly exotic flavors. As the ingredients list shows, it is quite a tasteful and flavorful seasoning. Recipes for making Old Bay Seasoning at home can be found on the Internet, and many people have changed the recipe to customize it just for them. Old Bay Seasoning is used for more than just crabs, much more. While as we’ve said Old Bay was developed for serving crabs in the bars of Baltimore, people put it on basically anything, such as popcorn (it would be hard to get the seasoning into a movie theatre though, ha), eggs, salads, fries, chips, hamburgers, other seafood, and more. It really can be used on anything, and there are even people who probably put it on pancakes in place of maple syrup! Of course, the majority of people use Old Bay to season their crabs, and other seafood, which is what it will always be predominantly used for. Old Bay not only brings out the full taste of crabs, but adds additional flavor to the dish. And with the right combination with other seafood seasonings, crabs can taste perfect. Old Bay isn’t the only seafood seasoning, there are several other pretty famous ones. 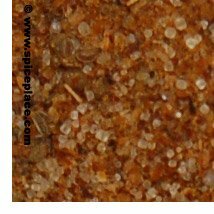 Another great seasoning is Nantucket Rub, which is used mainly for fish, but can also be used on meats such as chicken, and even on breads. The seasoning contains garlic, lemon zest, peppercorns, tarragon, and dill. It’s is named after how it is used; it is rubbed onto the food. Another fine brand is Zatarain [also produced by McCormick & Co.], which has produced many different kinds of seasonings. Most of the seasonings McCormick produces under the Zatarain line are meant to be used on seafood, and some are to be used exclusively on certain fish, such as shrimp. The Zatarain also includes products other than seasonings, and it is famous all over the United States. Another “Rub” seasoning is Bayou Rub, Cajun Seasoning, and Red beans & Rice. The Zatarain’s Cajun seasoning is used for blackening different meats, mainly poultry and seafood. It contains garlic, paprika, onion, black and red pepper, thyme, oregano, and lemon peel. When mixed with other seasonings, the result can be quite delicious. 1. Mix all ingredients except the lump crabmeat. 3. In a large bowl, gently mix crab and mayonnaise mixture. Shape into 5 or 6 cakes. Place shaped cakes on a cookie sheet covered with non-stick aluminum foil. 4. Broil about 10 minutes until tops begin to brown. Turn and broil other side 2 – 3 minutes. 5. Serve with tarter sauce. We have a few crab cake recipes on our web site. On our Old Bay Crab Cake Classic page are links to many of our favorite crab cake recipes. Our absolute favorite is the crab cake made with Old Bay Crab Cake Classic. We enjoy this crab cake for two reasons. First and foremost because it absolutely tastes great. Second, because it’s easy to make. Mix the seasoning with crab meat, and a little mayonnaise, then cook. It’s that easy. But sometimes we’re looking for a change of pace and so last night we made Delmarva Crab Cakes which you can find a link to on the Old Bay Crab Cake Classic page. 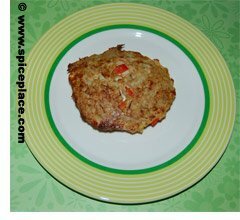 This recipe is a little different then most crab cake recipes because it uses bell pepper in the ingredients. We chose to use red bell peppers since that’s what we had on hand. Note that the Delmarva Crab Cake recipe calls for using 2 pounds of crab meat, so if you are like us and only use one container of crab meat, you’ll need to cut quantities in half. Our Delmarva Crab Cake recipe made a delicious set of crab cakes. We found we needed to broil them a little longer then the recipe called for. Maybe 12 minutes to the first side and 4 minutes to the second. We have one other crab cake recipe worth sharing and it’s the Old Bay Crab Cake Recipe that is essentially the the same tasting crab cake as you’ll get from making the crab cakes with Old Bay Crab Cake Classic, except you do the labor and break up the bread pieces. It’s an excellent crab cake, no doubt about it. Every region of the country or world for that matter, has it’s foods and tastes that are unique to the area. New Orleans is known for Cajun foods, Philadelphia for pretzels and cheesesteak sandwiches. Here in the Mid-Atlantic, one of the regional specialties are Cheasapeake Bay blue crabs. The Delaware, Maryland, and Virginia region is dotted with crab houses. These are restaurants that serve a variety of local seafoods, but specialize on steamed blue crabs. The blue crabs are steamed and seasoned with Old Bay Seasoning and salt sprinkled over the crabs. Lots and lots of Old Bay is used. Then they are served piping hot with corn on the cob, french fries or hush puppies. Some folks like to have a dish of melted butter, mayonnaise, or vinegar on hand to dip the crab meat in before eating. Eating crabs in shell is a messy, hours long event, usually served with ice cold draft beer. There’s usually lots of newspaper on the table to soak up the juices, and even more paper towels around to wipe ones hands. The interesting thing about the the seasoned crabs is that seasoning doesn’t make it through the shell of the crab. Instead, the seasoning transfers to your hands while you are opening the crabs, and transfers to the meat as you pick the meat from the shell. You have to be careful as you open the crabs not to get cut on the shells, otherwise the seasoning will get into the cut and hurt like the dickens. Usually, one does get a few scrapes, and all in all it’s just part of the crab eating experience. Some folks are more squeamish, or don’t like the messiness of eating steamed crabs in shell. For these folks, they like it when someone else has done all of the work for them and picked the meat. We’re not meaning here that a friend will pick the meat for you. Instead we’re talking about professional crab meat pickers that will pick the cooked crabs, which are then generally sold in 1 pount plastic tubs at different prices depending on where in the crab the meat came from. Lump back fin crab meat usually has the highest cost is the most prized meat. Claw meat usually has the lowest prices, with machine picked claw meat being the lowest quality and having the lowest prices. So for those that like the social scene of the crab feast, like the taste of crabs, but don’t want to break the crabs apart and pick out the meat there is nothing like a well made Maryland Crab Cake. These are cakes of crab meat about 3 – 3 1/2 inches in diameter that are either broiled or fried in canola oil. Since blue crabs already have some fat in them, we recommend broiling them to reduce the fat in your diet. However the fried crab cakes are delicious and have a different texture. The Old Bay Seasoning adds the essential Delmarva crab cake taste, while the other ingredients will be the binder that will hold the cakes together after cooking. You don’t want crab cakes with too much bread or bread crumbs. That is, you want a crab cake with just enough bread to bind the meat together and not a cake filled with bread — you want a crab cake. While you might be able to find some quality crab cakes in the frozen food section of your grocery store, the only real way to get a quality Maryland Crab Cake is to make it yourself. We have a bunch of links to other Crab Cake Recipes. *You have to use real mayonnaise with eggs in order for the crab cakes made with Old Bay Crab Cake Classic to bind together. The crab cakes will fall apart if you use eggless mayonnaise.